Edit: This post was recently included in the 200th edition of the Friday Ark. Pop over for more great posts. The frequent rain this spring and summer has meant that hay farmers have had trouble harvesting their crops, and my mom ran out of her winter supply some time ago. She’s been stretching her reserves with the help of a few bales from a neighbour, while waiting for her hay dealer to have new hay available. In the meantime she’s been investigating other potential sources to tide her over. We swung by a farm at the corner of my parents’ street on our way out to town this week, to see if they had a few bales they might be willing to sell. For most of my childhood I remember it as a horse farm, with hay growing out front and a couple of horses hidden in the back field. The farm was sold about 10 years ago, and the new owners have a menagerie of different creatures. The owner breeds birds, primarily parrots but also a number of species of exotic waterfowl. And, in a fenced off area containing a small bubbling pond, flamingos. There they were, real live flamingos, in all their splendid pink glory. What a funny choice for a pet bird, I thought. They weren’t alone in the enclosure, the waterfowl also paddled in the pond. The flamingos were the most numerous, however; I think there were eight individuals. My mom spoke with the owner regarding the hay, but also chatted about the birds. My impression was that he sells his birds’ offspring. I wouldn’t have thought there was a big market for backyard flamingos, so I’m not sure who his buyers would primarily be, whether they’re private enthusiasts or zoos or wildlife parks or what. (Perhaps Wren of Wrenaissance Reflections would like a few for her yard, to join her current flock?) I didn’t think at the time to ask a lot of questions about them, being more focused on admiring the birds themselves, though I’m sure he would have been kind enough to provide the answers; an oversight of mine. Their legs seem ungainly, extraordinarily long for their body size. The length of their legs is useful for keeping their body above the water while they’re wading, looking for food. Of course, with legs that long, you need an equally long neck to be able to reach the ground if you’re in shallow water. They look even stranger in flight than they do on the ground, with their long neck sticking out one end and their long legs sticking out the other, their wings spread out to each side, and hardly any body left. My neck gets tired just looking at them. If I were a flamingo, I’d curl my neck in to my body like a Great Blue Heron does. None of these birds were going anywhere, though, I believe the owner had all of his birds pinioned or feather-clipped, since the enclosure was open-topped. I’m not positive what species these are, since at the time I just assumed them to be Greater Flamingos and didn’t ask. However, there seems to be quite a bit of confusion on the web, and trying to find representative photos of the different species is tough. 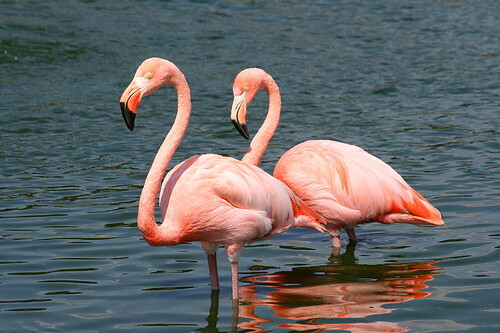 They’re either Greater or Caribbean Flamingos (Phoenicopterus roseus or P. ruber), but the two were once considered conspecific, so some photos may still be labeled under the old classification. I think these are Caribbean, however, based on the eye and bill size – the Greaters seem to have tiny eyes and huge bills, while Caribbeans are more balanced (as much as they can be with such a honkin’ big snoz). There’s also a Chilean Flamingo (P. chilensis), which also used to be considered conspecific but has now been separated. However, it’s easy to tell apart by its gray legs. I like a straightforward field mark. The Caribbean is native to Cuba and Mexico south to Venezuela and the Galapagos. It’s occasionally sighted in Florida, but most of these are considered to be escapees because it is so commonly kept in captivity. However, at least one banded individual was initially from the Yucatan, and some others may be genuine vagrants from Cuba or elsewhere nearby. Flamingos are pretty neat birds. Aside from their bizarre shapes, they have some interesting adaptations. Their colour is primarily obtained through their diet. When the bird is growing in new feathers, which it does once a year, the red pigments contained in the shrimp that make up the majority of its diet are deposited into the feathers, giving them the flamboyant salmon pink colour. The owner indicated that the colours are brightest in fall when the feathers are fresh; as the feathers age, they fade in colour. In captive birds, these pigments are usually obtained through supplements added to their foods (for instance, processed shrimp in the birds’ regular pellets). 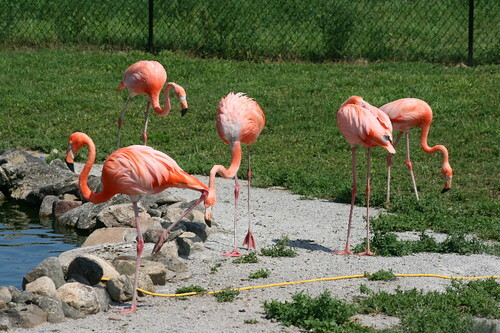 It’s the pigment molecules that are important; without them, a flamingo will grow in white feathers. This premise applies to many species of birds, mostly red or orange ones. The American Birding Association magazine Birding recently ran an article about such pigments affecting the plumage of Baltimore Orioles – check out the pdf for more info on the phenomenon (Blackburnian is one of the authors!). A well-fed bird will have more brightly-coloured plumage, which is a good indicator to potential mates of the health of the individual. 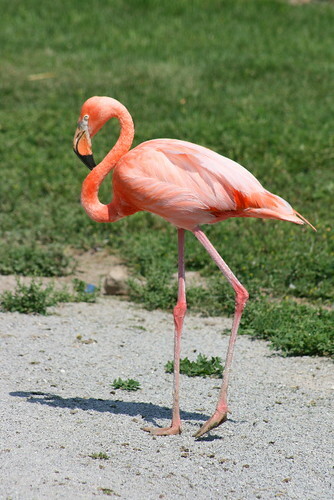 Flamingos have really interesting bills, backwards from the bills of most birds. In most birds, the upper mandible is larger than the lower one (especially pronounced in the birds of prey), but in flamingos it’s the opposite – the lower mandible is the larger one. It’s also bent in a funny way that you don’t see in most birds. The reason for it is their feeding habits. 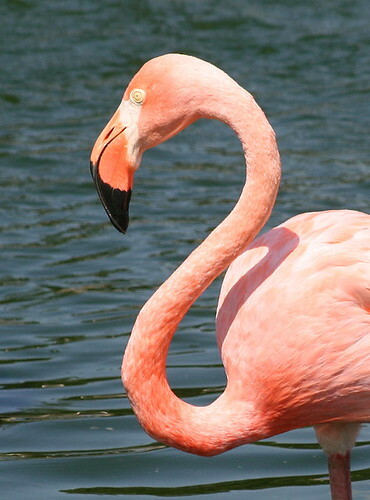 Flamingos are filter-feeders, straining out invertebrates from the water, primarily brine shrimp. They have hair-like filters called lamellae, which are very similar to what a baleen whale uses to feed. Feeding is accomplished in a similar manner, by taking a mouthful of water and pushing the water out through the lamellae, trapping the critters against the filter. The bill is bent backwards so that when the bird lowers its head to the water, the bill is parallel with the surface, facilitating feeding. 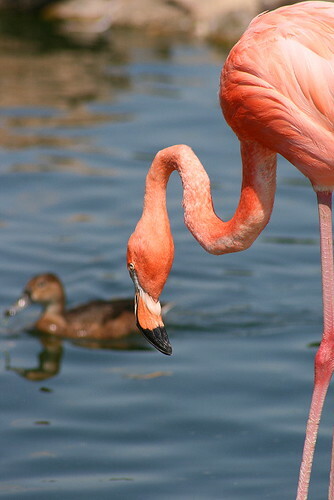 Young flamingos are gray, and obtain their pink plumage in their first moult into adult feathers. They also have relatively straight bills, which straighten out and take on the distinctive colouration as the chick ages. It takes about two months from hatching for a chick’s bill to become developed enough for it to filter-feed. During that time, the parents feed it a milky secretion produced by glands lining the upper digestive tract. The “milk” contains the proteins and nutrition the chick needs, as well as white and red blood cells. The only other group of birds to produce “milk” to feed to their young are the completely-unrelated pigeons and doves of the family Columbidae. Flamingo “milk” contains more fat and less protein than pigeon “milk” – somewhat interesting as one would think the adults’ diet of shrimp would contain less fat and more protein than the pigeons’ diet of seeds. I’ve just picture-googled storks and Sandhill Cranes, so I guess it is normal, but I was surprised at how low the flamingo’s neck attaches to its body. It’s almost as if its intake hose were attached to the undercarriage! Maybe with fewer fluffy feathers and such long, bendy necks, the illusion is greater in flamingos than in other wading birds? Hee. Good question, Mungo. I rather suspect they’re brought into the greenhouse or barn in the winter, although I didn’t think to ask that, either. I know that the Toronto Zoo brings their birds inside once it starts getting cold out. I hadn’t noticed that either, Lavenderbay, but it does seem to hold. Flamingos definitely seem to be thinner birds overall, so it may just stand out more on their small bodies. these yard flamingos looking very beautiful. Pink Flamingo Flocking Fundraisers are so successful we are willing to put our money where our beaks are. If your organization is short on funds but long on passion for your cause, we are here to chip in. Pink Lawn Flamingos are great for Flamingo Fundraisers or for your garden. Our Classic Flamingos are made in the USA, stand almost 34 inches tall – that is 8 inches taller than anyone else’s flamingos. When it comes to Pink Lawn Flamingos, 2 things matter most, the height and the quality. Taller is better and 30 inches is the minimum height we would recommend for fundraisers. hi, im trying to get 2 flamingo’s for any price, were can i get a pair ?? ?